Warning: the following outfit has a lot of details and embellishments! From my bedazzled denim jacket down to the crystals on my plaid shoes, there's a lot going on with this ensemble! I bedighted myself with this bedecked outfit to go Christmas shopping at the mall last weekend. One of the sales associates even asked me if I was a designer, to which I regretfully responded, "No". Secretly, I think being a designer would be a really fun job to have but, unfortunately, when it comes to clothing, I can't sew to save my life! The sales associate probably thought that I made the jacket myself but, sadly, I am not that talented! Now that I think about it, however, I probably could have made this jacket with one of those bedazzler guns from the 80s! Speaking of denim jackets, I have honestly lost count of how many I own! When I saw this particular jacket, however, I reasoned that, of all of the denim jackets I own, none have pearls and rhinestones for embellishments, so that made it okay for me to add it to my denim jacket collection! As an added bonus, it was a really great deal from Anthropologie, as it originally sold for $158 but was marked down from that and featured an additional percentage off. That brought the bedazzled denim jacket's grand total price to around $50! While this jacket is, unfortunately, no longer available online, you might be able to snag one in store. This one was the last one left at my local Anthropologie, but you might get lucky at yours. 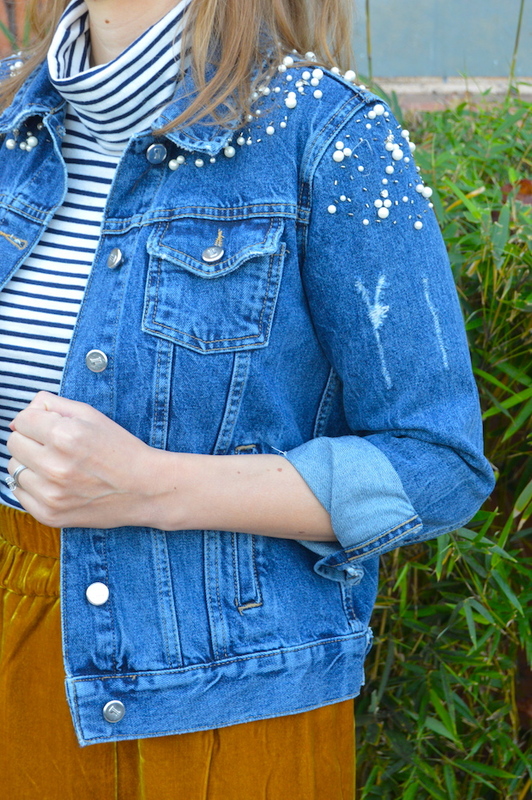 It sure seems as if a lot of designers have followed the embellished denim jacket trend, so I've linked to a few more fun options below! Last of all, I couldn't believe how many people liked my shoes when I was shopping at the mall! These shoes were a splurge from last year, and I do love how they have only a small heel and, of course, the crystal embellishments makes them extra special! As I wrote in one of my previous posts, I don't get a ton of wear out of my seasonal plaid shoes but I do get a lot of enjoyment from them, and that's all that really matters! Oh my gosh, SO cute! I'm not usually a "bedazzled" type of person, but I really like the way this jacket was done, with the different size "pearls" and, it looks like, metallic bugle beads? I like! 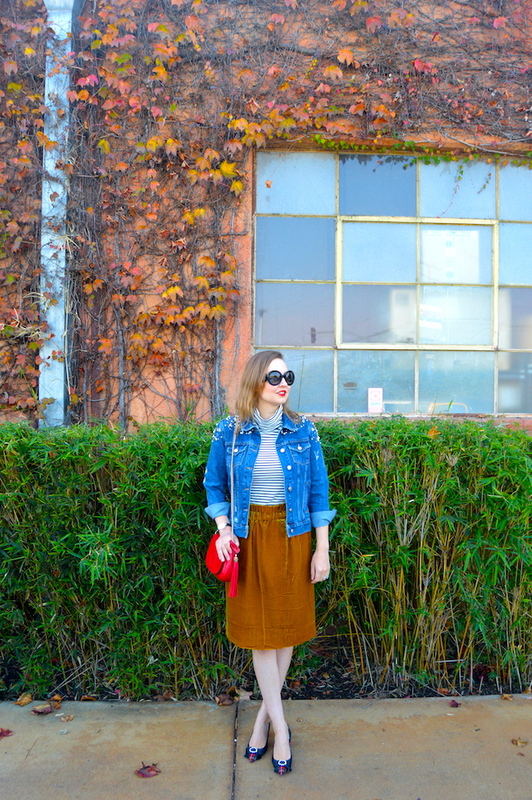 Love the mustardy velvet skirt, what a find! 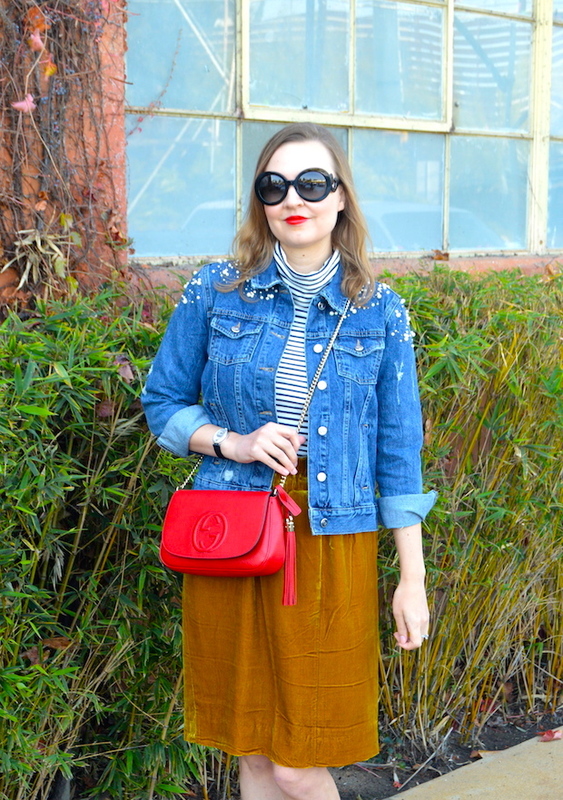 AND the darling plaid shoes, AND the striped turtleneck! I have a heck of a time finding Just the Right Striped Top (I'm plus size) and I feel like I would wear it with anything and everything! I bet you were flattered with the designer comment! :) I just love this jacket and I agree, def. worth purchasing it... because, how many jackets have pearls and are embellished? And, it's just the right amount! I love that skirt, it looks like its velvet. And your shoes!! So pretty! I love all the embellishments! I can't sew either, sure wish I could I don't have the patience. 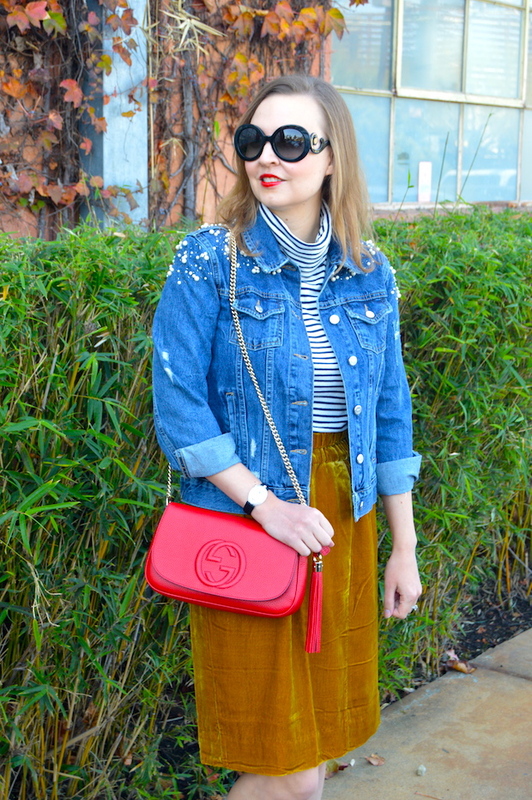 Thanks for linking up with Thursday Moda!